Sometimes silence doesn’t get its due, especially by people like me who are always struggling to better hear and make sense of the sounds around us. But I recently had an experience that made me appreciate silence; and crave it, and miss it when it was no longer there. Here is what happened. 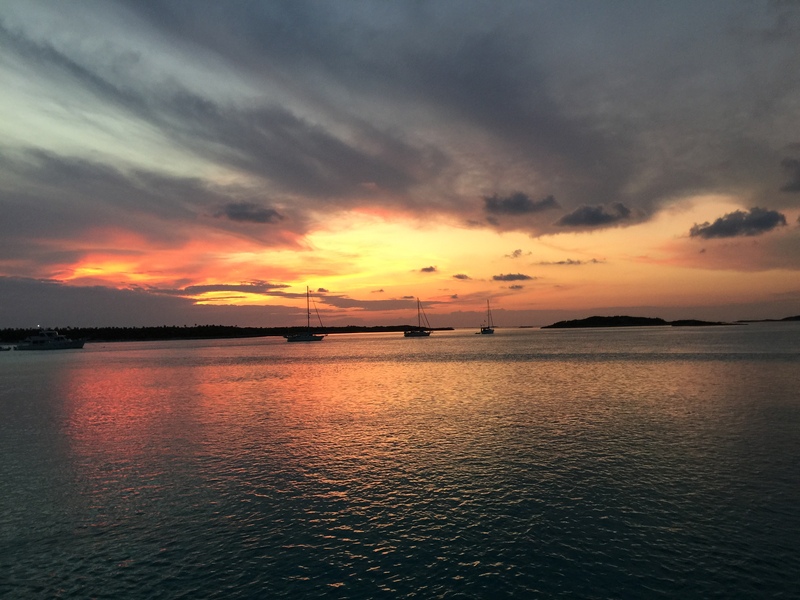 I was recently extremely lucky to spend a week on a boat in the Exuma Islands of the Bahamas. It was exquisite in every way — beautiful sunsets, wonderful food, uninterrupted family time, and SILENCE. Our days were filled with water sports and other activities, and our nights were filled with peace and quiet. And by the way — I could hear almost everything everyone said because there was no background noise! I had truly never felt so relaxed and happy. I thought it was because I was on vacation, and that was part of it, but what I hadn’t realized was how much the silence had impacted my mood and overall sense of peace. Hence, the rude awakening when we were back on dry land and in the airport heading home. Almost immediately upon entering the airport, my body tensed up. I felt overwhelmed and exhausted. I kept asking my family if this airport was particularly loud, but they didn’t think so. I couldn’t think straight and I definitely could not hear anything anyone was saying. I put my hearing aids to sleep to mute the sound, but it didn’t really help. I was having a visceral reaction to the level of sound! As the hours passed in transit and we returned home to NYC, I began to acclimate to the noise level of real life. My body returned to its normal state of being and I remembered how to concentrate in order to hear conversation. But I still miss those days of silence, with only the light breeze for a soundtrack. Readers, do you love the sound of silence? ← Do You Get Hearing Loss Exhaustion? Yes! Silence is restorative on many levels–and there is no feeling that I am missing something I can’t hear! do not have to worry about someone talking to me. It is the only time my brain really rests. Quiet can be so therapeutic. Thanks for sharing your thoughts. I’m 70 and have worn hearing aids for only 9 years for a cookie bite hearing loss. When I am home alone, I usually don’t wear my aids because I don’t like traffic sounds, neighbors yelling, etc. I’ve had friends who seem to HAVE to have noise (TV, radio) all the time. I think those people don’t like to live with their own thoughts! Thanks for reading. Sorry to hear about your ear! Sorry – WordPress autofilled my details with the wrong Twitter name – I’m @GregClementsUK. Look forward to reading more of your tweets! I’ve just stumbled onto your blog and have enjoyed reading the articles so far, thank you! I will be getting hearing aids in early 2015 (after I can fund my FSA) and look forward to being able to hear more/better. It’s exhausting at times to strain to hear. One thing for me though, is that silence is NOT my friend because then I hear the ringing in my ears which is more bothersome than having a variety of white noise (HVAC, humming appliances, background music etc.). I have a lot to learn, research about hearing aids and am amazed at how much technology has advanced over the years! oops, make that early 2016! Good luck to you with the new hearing aids! There will be an adjustment period, but it should make it much easier to socialize and enjoy things again. Glad you are enjoying the blog! I love the sound of silence but haven’t had any silence in the pure sense for 12 years since first experiencing tinnitus. In the 4 months since my original diagnosis of sudden hearing loss and more recent second opinion diagnosis of Meniere’s disease, silence is even more illusive as I often hear 2 tinnitus sounds in my ear with hearing loss along with the less obvious and quieter sound in the ear that does not experience hearing loss. The consequence of this is that I’ve had to redefine “silence” and it now means only one sound: the original tinnitus I’ve had for 12 years. I have fluctuating pressure and hearing so the impact of background noise is unpredictable at best and painful at worst. Sometimes background noises are comforting; other times, they’re irritating. A consistent meditation program has helped me remain calm and optimistic that whatever I’m experiencing is temporary and impermanent. Thank you for sharing your experiences. I use meditation to help with my tinnitus too. It can be a big help.